The OR-FAB HDX Rear Bumper’s compact design, great lines, and increased clearance angles make it function almost like a stubby bumper for the rear of the vehicle. 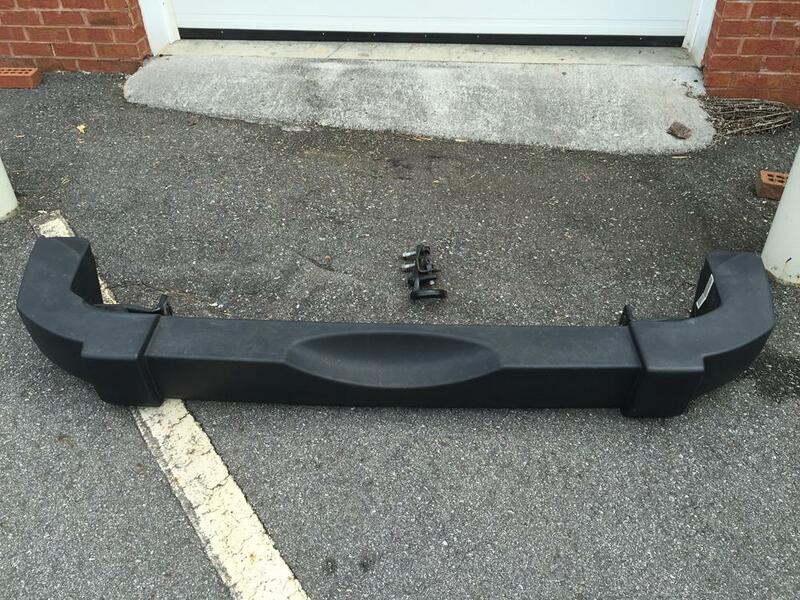 The bumper also features a beefy tire carrier that moves with the tailgate, just what the doctor ordered for holding my spare BF Goodrich 35″ KO2. 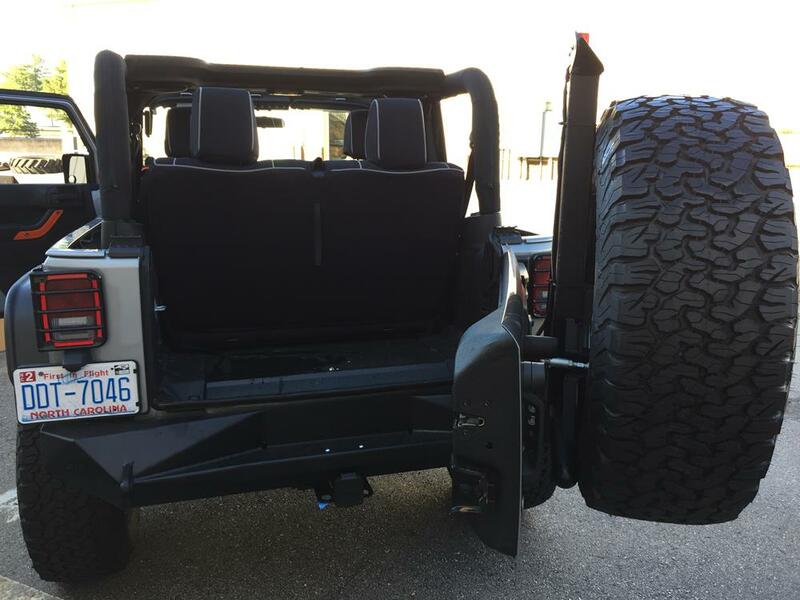 The HDX Rear Bumper perfectly compliments the OR-FAB Stubby Front Bumper. 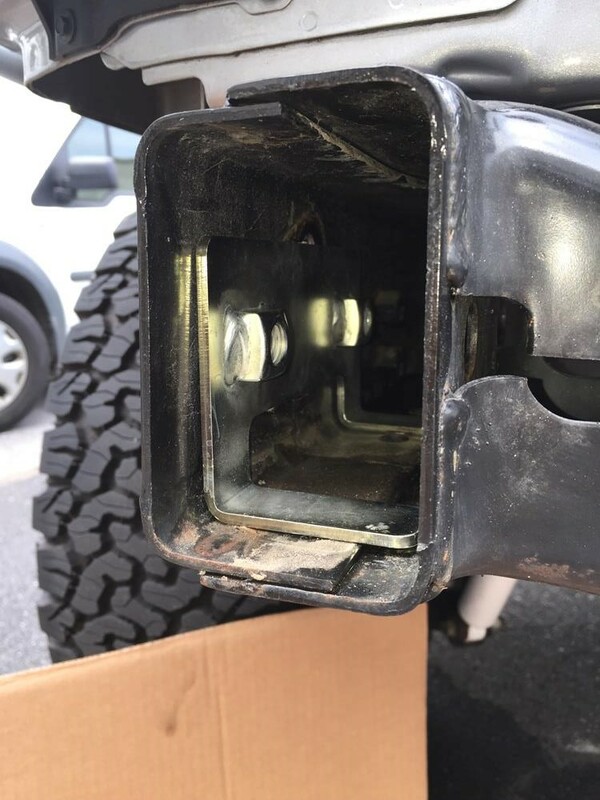 To get started, I removed the stock bumper and re-routed the hitch wiring so that it would not be visible on the side of the Jeep once the new bumper was installed. 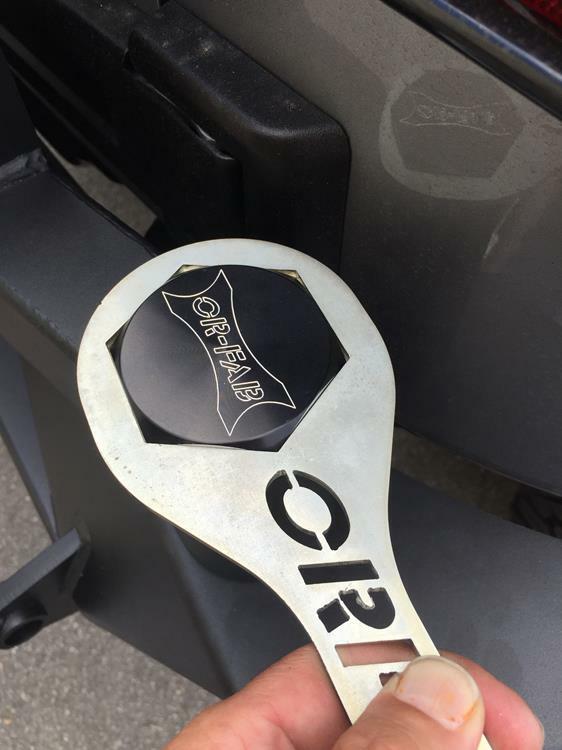 I replaced the factory nut plate inside the driver side frame rail and added a nut plate inside the passenger side frame rail. 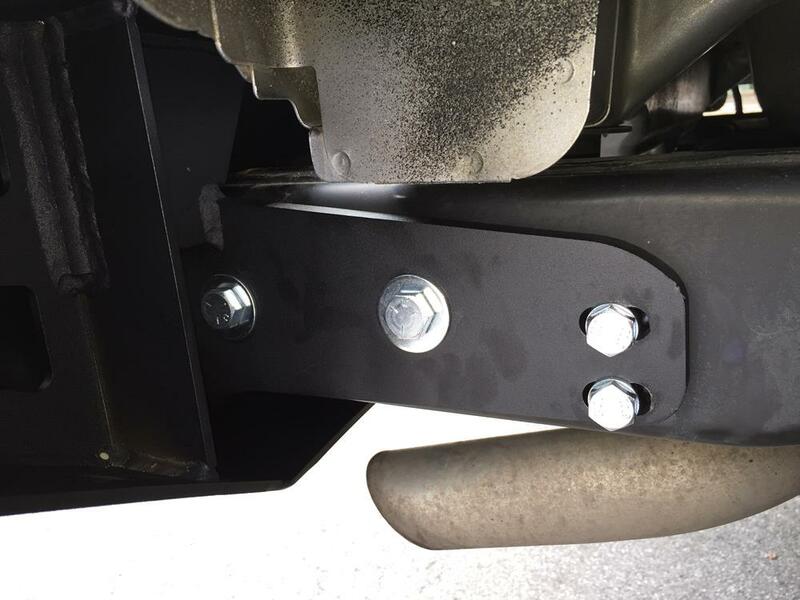 I also took out the (2) center bolts from the factory hitch mount and replaced them with longer bolts to hold an anchor bracket that supports the middle of the OR-FAB Bumper. The bumper has extensions which slide on the outside of the driver and passenger side frame rails. I screwed (2) bolts screw into the nut plate and (2) bolts into the frame rail on each side. I screwed (2) bolts into the middle anchor bracket. Make sure you are completing these steps with the Jeep parked on a level surface. 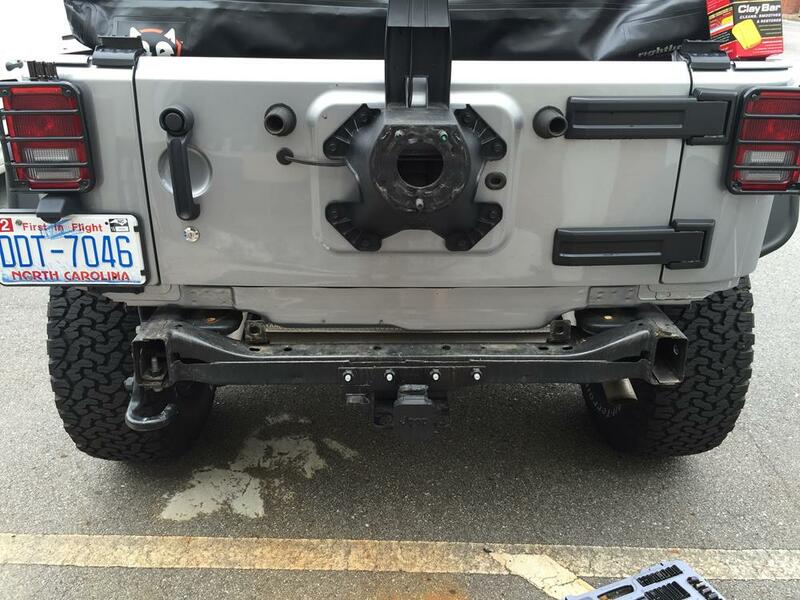 Check the bumper with a level before fully tightening the bolts down. 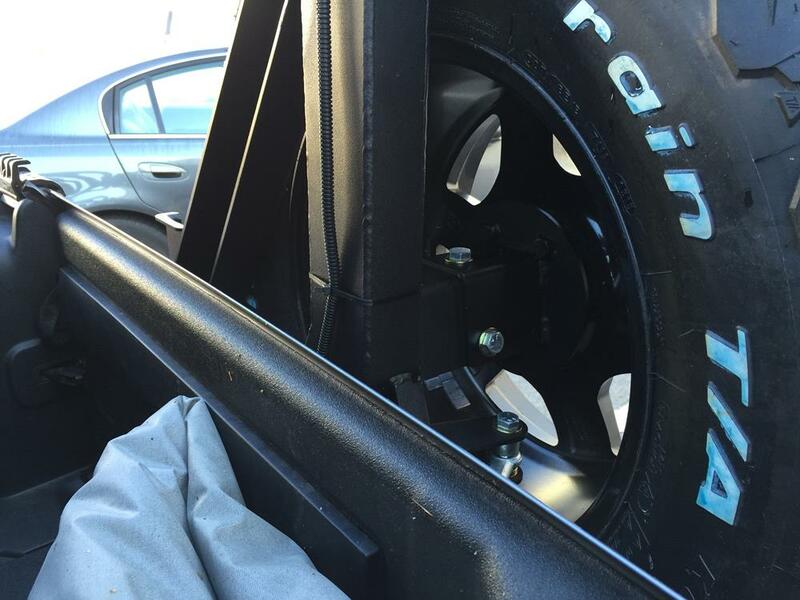 The leveling of the bumper becomes extremely important once the tire carrier swing arm is added. I thought I had the bumper level only to find out later (by eyesight and rechecking) that I did not. It is really hard to find a level piece of ground anywhere if you don’t have the benefit of a garage to work in. Our search for level ground led us to the service bay of Anderson Nissan-thanks guys! 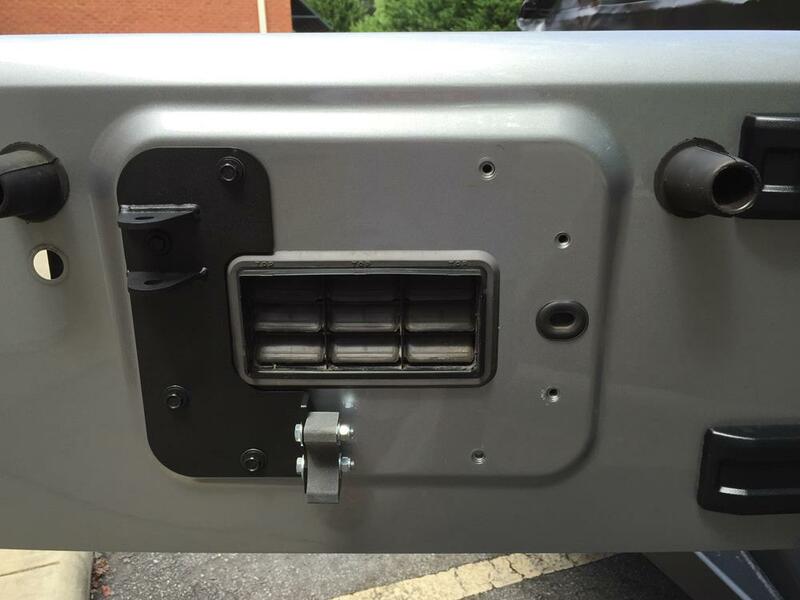 I next attached the rear pivot plate to the Jeep’s tailgate. After running to my trusty Advance Auto Parts store to pick up a bearing race driver, I used the new tool to hit the bottom bearing into the housing of the swing arm. You can see that I greased up the bearing pretty good before driving it home. 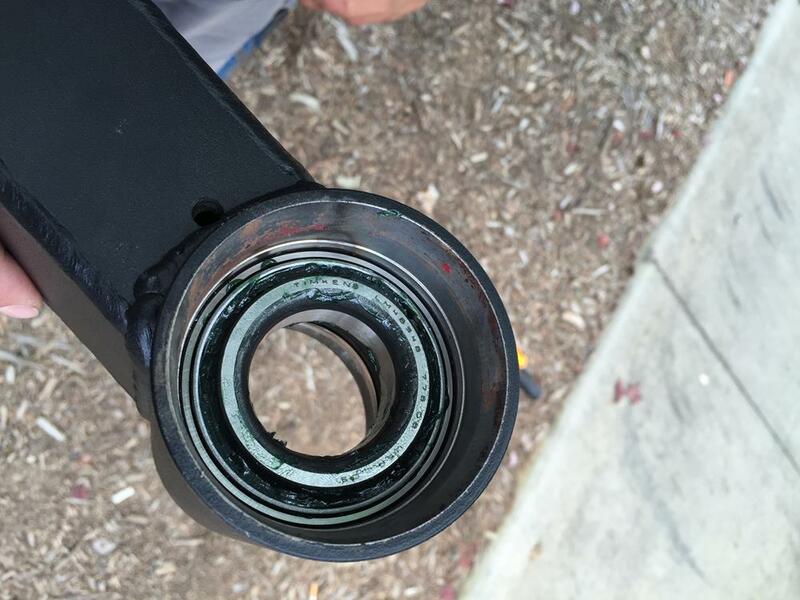 The next step was to install a bearing seal over the bottom bearing. It was a little confusing to the uninitiated bearing installer as to which was the top and which was the bottom of the seal. After a clumsy effort with the bearing race/seal driver tool, I resorted to using a flat head screw driver to bang down the outer edge of the seal. This effort did nothing but destroy the seal. After another trip to Advance to get a replacement seal and some advice, I proceeded to gingerly bang in the seal using the race/seal driver tool and a rubber hammer. It is a great moment when you feel the seal seat properly against the bearing-true success! The housing of the swing arm slides over the spindle on the passenger side of the rear bumper. I was surprised at the quality of precision fit OR-FAB has achieved; there is no play between these (2) parts what-so-ever. I drove the top bearing over the spindle and down into the swing arm housing by placing the large washer over the bearing and tapping it down using the large socket that I would later use to tighten the nut over the spindle. 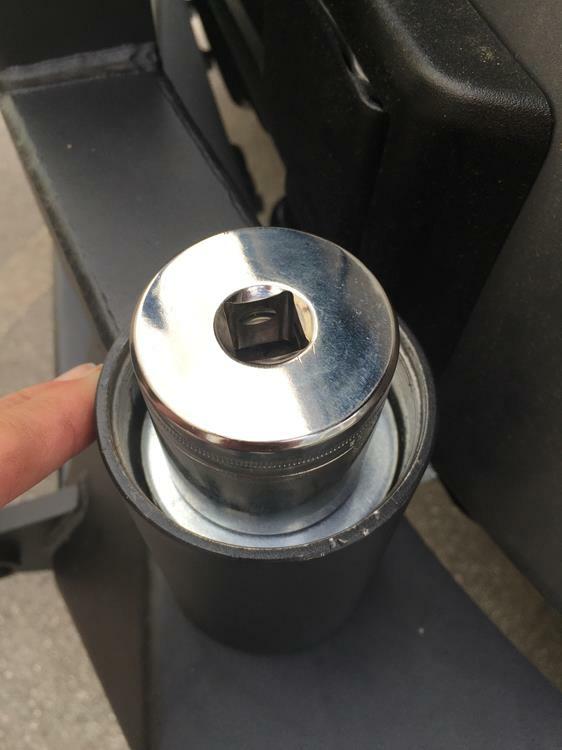 Let me reiterate: the large socket – I believe it was a 36mm! 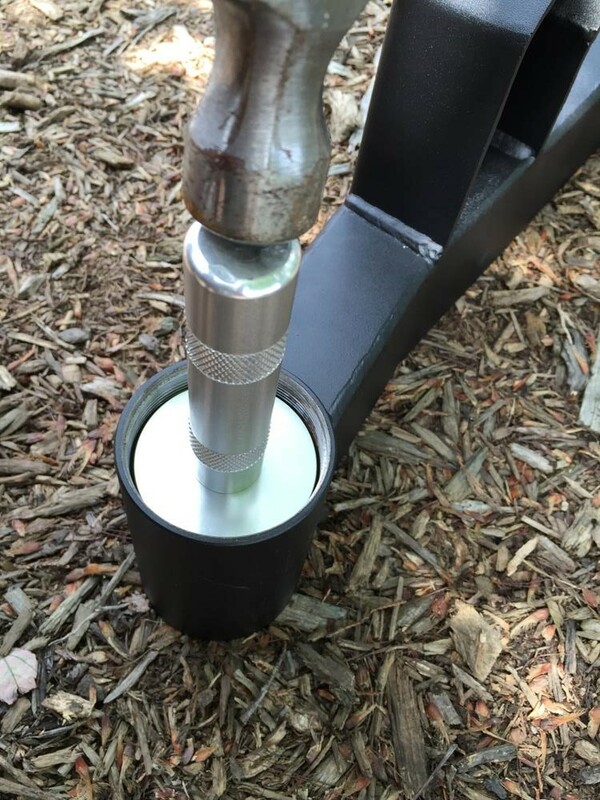 After tightening down the self locking nut, I installed the cap which OR-FAB provides as a great finishing touch. A special tool was provided to wrench on the cap. Next came the step that requires some great foresight, smarts, engineering precision and, most importantly, a level bumper to get it right the first time (I did not have all of these things!). 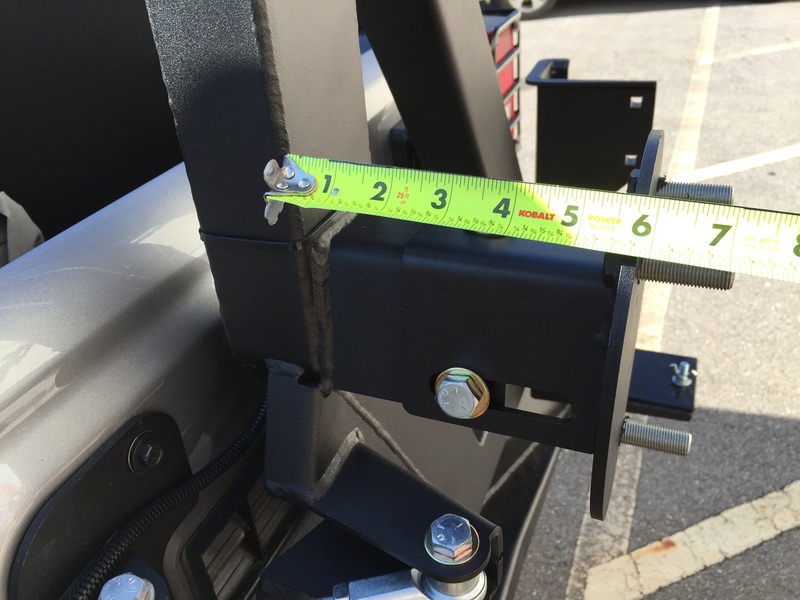 The goal is to attach the tire carrier swing arm to the tailgate pivot plate so that the spare tire will be held securely when the tailgate is closed and will swing out with the tailgate when the tailgate is opened. 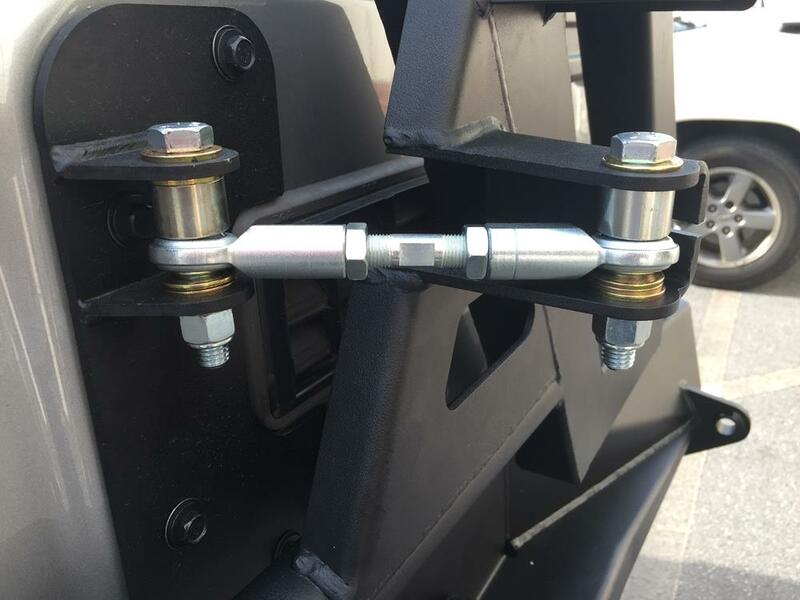 This seemingly impossible feat is accomplished by attaching a heim joint rod assembly between the carrier swing arm and the tailgate pivot plate. I needed to use a combination of the supplied spacers and washers to center and level the rod assembly between the attachment tabs. 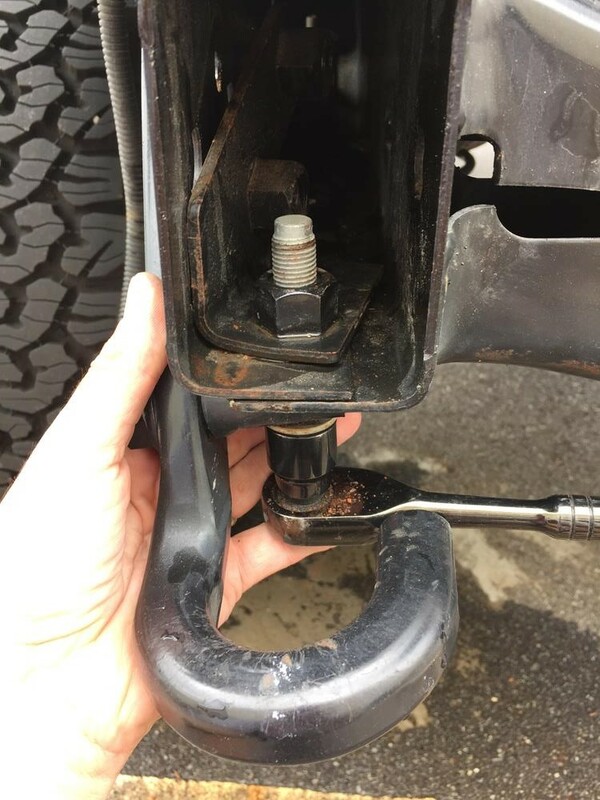 The rod assembly must clear the attachment tabs as the tailgate is opened. It took me trying a couple different combination of spacers and washers before I got it right. 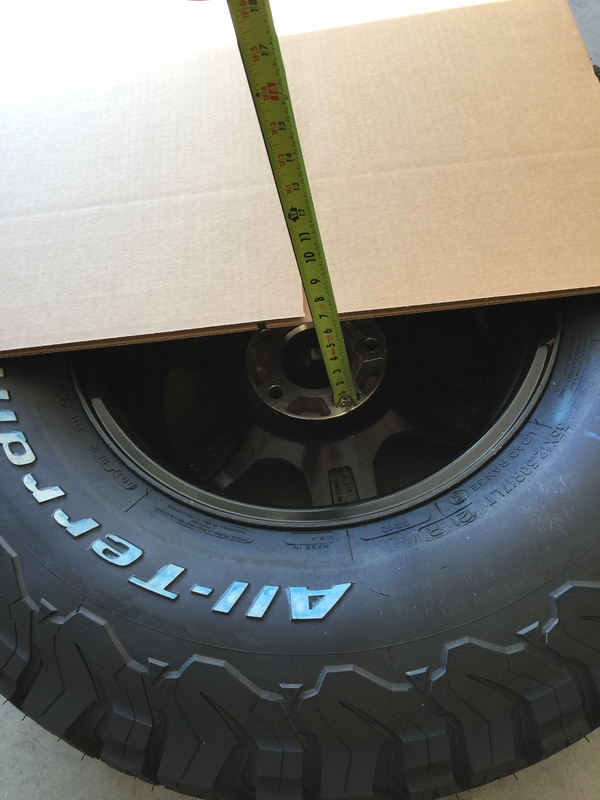 To properly install the tire mount to the rear of the swing arm, I first measured the backspacing of my wheel/tire…..
…and then made the spacing between the tire carrier arm and the tire mount the same distance. (3) bolts hold the tire mount in place. 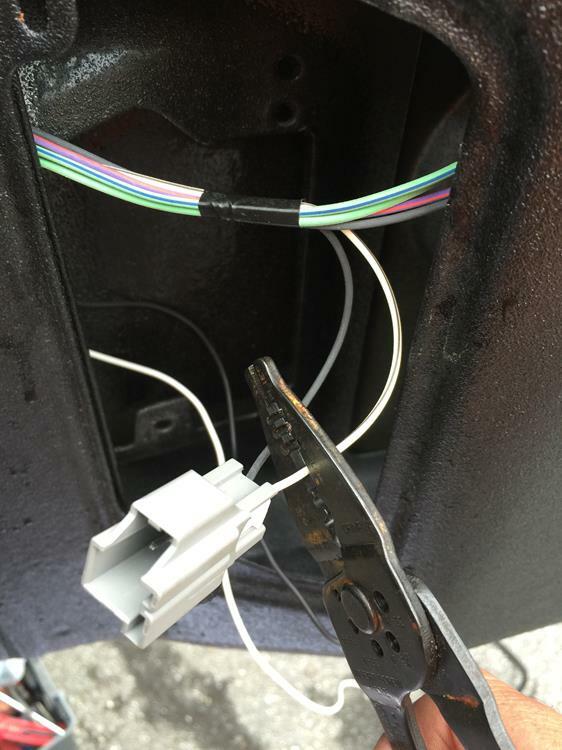 I bolted the LED light to the top of the tire carrier mast and connected the red (+) and white (-) wires to the extension wires (which are black and white). The light’s black wire is not used. 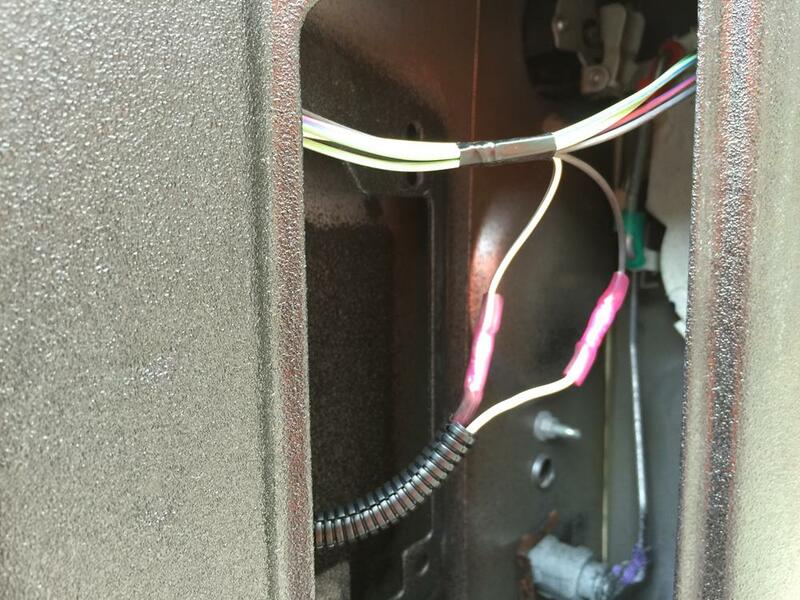 Inside the tailgate, I cut the 3rd brake light connector off so that I could connect my black and white wires to power. Strangely enough, black needed to connect to white and white to black for the light to work. 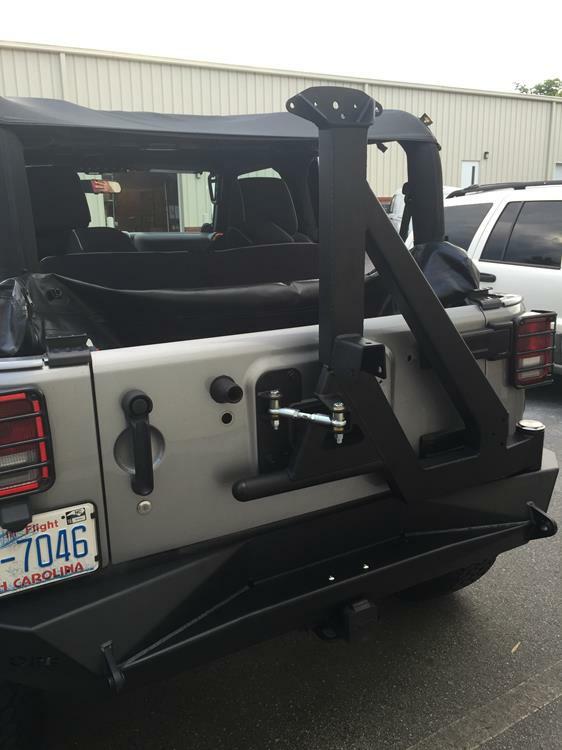 The rear bumper/tire carrier is truly a highly engineered product. The tailgate opens effortlessly and the carrier swing arm moves smoothly on its bearings. The strength of the whole system and the way the heim joint rod assembly moves is truly impressive. The weight of the tire is dispersed over the whole system, so you feel only a small portion of it’s weight. To complete the rear of my rig, I will be adding the OR-FAB Hi-Lift Jack Carrier to the tire swing arm (see later post). I couldn’t be any more pleased with this set-up – Thank You Steve Rezek and OR-FAB!